DiCamillo, K. (2009). The magician’s elephant. Somerville, MA: Candlewick Press. 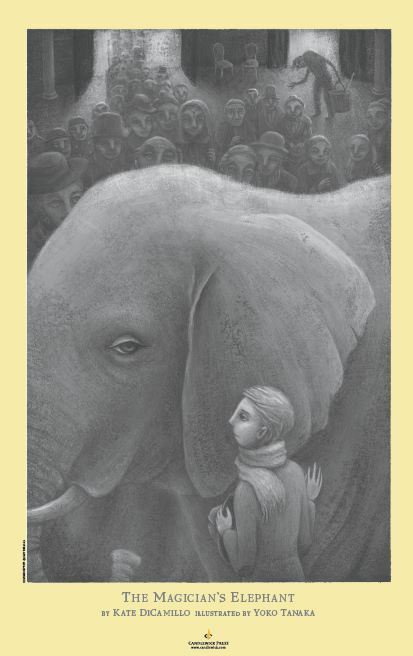 “When the elephant opened her eyes and saw the boy standing before her, she was not at all surprised. She thought simply, You, Yes, you. I knew that you would come for me”. 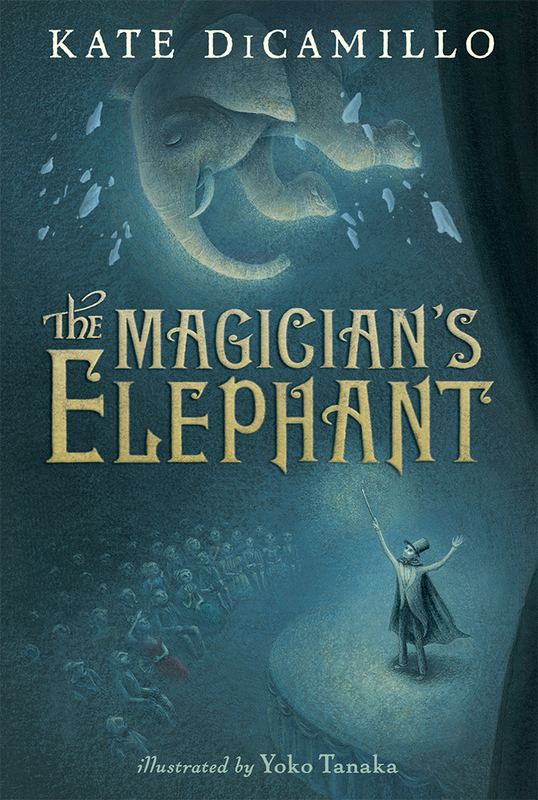 The Magician’s Elephant is written by Kate DiCamillo, the winner of the Newbery Medal for The Tale of Despereaux, received a Newbery Honor for Because of Winn-Dixie, and praise for The Miraculous Journey of Edward Tulane. DiCamillo tells a story set in Baltese, “in a dark and cold city at the century before last” about Peter Augustus Duchene, a 10-year-old boy who searches for his sister he was told was dead by his guardian after he was orphaned by his parent’s deaths. After spending his florit not on food but to a fortune teller, Peter is told that the “truth is forever changing” and “she is still alive” and to find the elephant that will show him the way to her, his sister. After learning that his sister Adele is alive, Peter’s journey begins and is filled with wonder, surprise, and of course magic. Peter to his surprise discovers at the fish market that an elephant is in Baltese, and has been imprisoned by the police tells of an elephant that fell on a woman’s lap crippling her legs. The night the elephant came crashing through the ceiling of the opera house; it shocked even the magician who promised that he only intended to produce flowers. The magic of this story truly has more to do with the fact that to save the elephant and find his sister requires the assistance of the intertwined fates of Peter and the other eccentric characters such as his guardian an unstable ex-soldier Vilna Luntz, the magician who wanted more from life, Madam Lavaughn crippled by elephant, Hans the manservant, the policeman, Leo Mantienne and his barren wife Gloria, a beggar and his dog, and Sister Marie, a nun that works at the local orphanage, and the elephant that changes everything. The Magician’s Elephant is set in magically fumbled and somewhat realistic world in which a boy’s hopes, dreams, and quests end triumphantly. A tale about trusting in the unexpected and the impossible becoming possible as the magician himself states, “Magic is always impossible,” said the magician. “It begins with the impossible and ends with the impossible and is impossible in between. That is why it is magic”. This book in a modern fantasy and poetic way discusses loss, acceptance, relationships, the effect of our choices and how they directly affect us and others, belief in oneself, hope, love, and most importantly, faith. The hauntingly realistic black and white haunting sketches by Yoko Tanaka are both delicate and somber. They are astonishing and appear realistic yet at the same time have an otherworldly appearance that is perfectly fitting to the setting of The Magician’s Elephant. The illustrations match accordingly with story’s setting from the clothing, time period, and cold wintery theme. Tanaka’s illustrations do not distract or overpower Kate DiCamillo’s story.